Finished re-equilibrating the columns that were left in 1M HCL last night. I rinsed them 5 times with water by adding 700 uL of NFW to the column and centrifuging for 1 minute at 10,000g. Then I rinsed them 3 times with TE buffer. Then, following the optional column equilibration step in the EZNA kit manual I added 100 uL 3M NaOH at centrifuged at max speed for 1 minute. Using these columns, I finished the DNA extraction that was started yesterday evening following the EZNA protocol. I then ran out the extraction on the DNeasy columns from 10/26 and the EZNA extractions with regenerated columns on a gel. Gel pic of DNA extracted using DNeasy kit. Gel of DNA extracted with EZNA kit using regenerated columns. Tissue was left in lysis buffer overnight. As you can see, neither of them look very good. With the extraction using regenerated columns, I’m not sure if it was the columns or the fact that they were left overnight. At least the SS2 samples were all repeats, but the SS4 samples will likely have to be re-extracted. Just to be safe I won’t be leaving samples digesting overnight anymore or trying to regenerate columns. The new EZNA kit came in in the afternoon, so I did a set of extractions using that kit and did not leave them overnight. 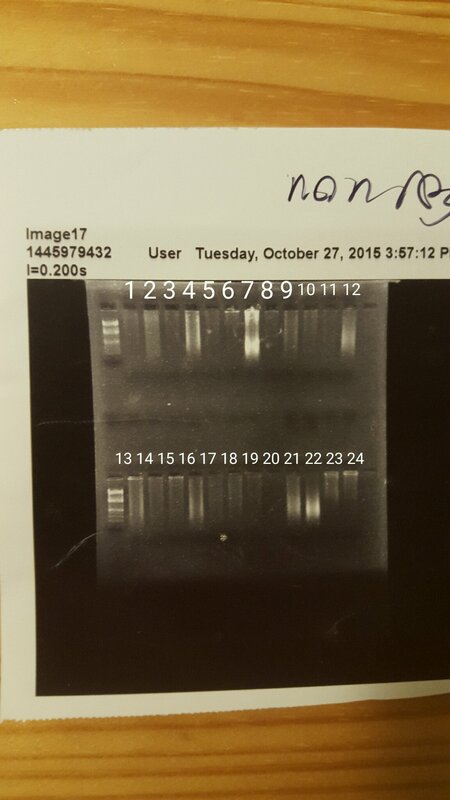 This entry was posted in Lab Notebook, Puget Sound Oly Common Garden and tagged dna extraction, Fall 2015 by ksil91. Bookmark the permalink.